I’ve been on a Murakami kick lately. A few years ago, I posted about my favorite Murakami novel, Kafka on the Shore. I listened to the audiobook again a few months ago with my husband, and he was so impressed that we immediately moved onto 1Q84. In the three months it took us to finish the audiobook, I also finished Colorless Tsukuru Tazaki and His Years of Pilgrimage and started A Wild Sheep Chase. 1Q84 didn’t — quite — manage to knock Kafka on the Shore off my number one spot, but it was a near thing. 1Q84 revolves around two protagonists: Aomame, a fitness instructor with a dark secret, and Tengo, a cram school teacher with literary ambitions. Early in the book, Aomame becomes convinced she has somehow stepped sideways into an alternate reality, which she dubs 1Q84 to distinguish it from the “real” world of 1984 she left behind. Meanwhile, Tengo gets sucked into his editor’s shady scheme to win a young writer’s competition through underhanded means. As their two stories unfold side by side, the hidden connections between them gradually become more apparent, as does the strange world of 1Q84. Murakami always cements his fiction so thoroughly in the everyday that the surrealism of his plots becomes as unquestionable as the lists of what his characters ate for lunch. 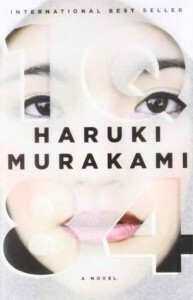 The matter-of-factness he uses to describe the fantastic world of 1Q84 was one of the highlights of the novel for me. The other were the parallel stories of Tengo and Aomame. The plot in 1Q84 grabbed me by the throat in the first chapter. During the three months spent listening to the audiobook, my husband and I spent a lot of time talking about it, wondering what was going to happen next. That said, at certain points, 1Q84 feels less like hurtling towards an inevitable conclusion and more like slogging through a swamp. At multiple points throughout the novel, Murakami’s characters lapse into long stretches of dialogue that do nothing but summarize everything that has happened before. Given that the novel was originally released in a serial format, that may well be a feature, not a bug, but for a reader approaching the book in a single (even three-month long session), it quickly grew tiring. I pressed on through those slow periods knowing that Murakami would eventually deliver, but they did distract from an otherwise excellent novel.